Update, April 9, 2016 at 12:17 p.m.: A previous version of the story incorrectly said that Senate Vice President Valencia Scott would be attending GA. She will not be attending, but Sen. James Cortright will be. 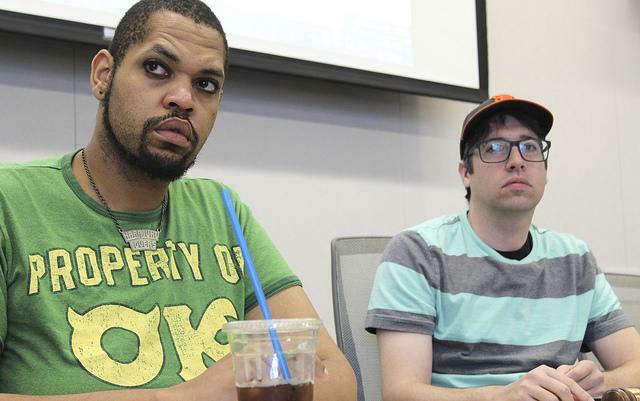 In 2014, American River College student government members David Hylton and Jeremy Diefenbacher were sent home from the Student Senate for California Community Colleges General Assembly (GA) in Los Angeles due to a substance use issue. Hylton admitted shortly afterward to being sent home for a marijuana-related incident. Diefenbacher declined to comment at the time. Hylton has apologized for his actions at the fall 2014 GA and also repaid a food stipend of about $80. Adviser Juan Blanco announced at Thursday’s Senate meeting that Hylton will be attending the spring 2016 GA.
Hylton plans on not repeating the same mistakes as in fall 2014. He said he acknowledged the responsibility that as Senate President his behavior should be held to a high standard. GA for the spring semester will be held in Ontario, California from April 29 through May 1. Hylton is considering getting a cannabis card, however, that would not allow him to smoke marijuana at GA according to its conduct policy. “I’ve been thinking of getting my (marijuana) script,” Hylton said. “(ARC’s) administration shouldn’t be able to tell me I can’t go. That would be discriminatory, especially after they announced I was good to go. Diefenbacher, Senate’s director of finance, will not be making the trip to southern California. “I was drinking,” Diefenbacher said about the fall 2014 GA.
“I just don’t want to be sober around these people, that’s why I’m not going,” Diefenbacher said. He said in a later interview with the Current that his reason for not attending is because he has more important obligations to focus on and that he didn’t “want to take the time out” of his day. According to the GA attendee conduct policy, it is essential for all attendees to act responsibly to ensure that their own conduct and attitude is beneficial to themselves and their fellow participants. The policy also explicitly states prohibited practices of the consumption of alcohol and the possession or use of illegal drugs. Other members attending GA, including Director of Affairs Legislative Laurie Jones and Sen. Roberto Garner, both spoke about attending the event. Jones said the expectation of her to behave well at GA is not only as a member of student government but also as an ambassador for ARC. Garner said he also has no intention of being sent home for inappropriate behavior. Director of Communications Tami Dunning will be attending GA not as a part of ARC’s delegation, but rather a member of the SSCCC. Senate used $8,600 to send five members of ASB and a chaperone. Sen. James Cortright and CAEB President Justin Nicholson are the other two members going, while Blanco will chaperone. Be the first to comment on "Student Senate President says he won’t bring marijuana to General Assembly"